You can purchase most of these knives at Blade HQ. The Knife Art exclusive is the obvious exception. Its April, so it is time to update my Best Of lists. These are regularly the most visited parts of the site and so it is something I will endeavor to do every year. It has been a whirlwind year with dozens of new and important releases. It has also been a year where a number of trends have culminated in amazing offerings. So before I get into the cutters themselves, here is my take on the state of the market. 2015 and 2016 were, according to Knife News, down years in the knife market. Its odd because as the sales trends dipped, the enthusiast core strengthened. Knives in terms of mass market were doing worse, but knives in terms of gear geeks couldn’t have been going any better. In 2017 things turned around, but anecodotally, I have been told that the growth in the market is happening in untraditional places. 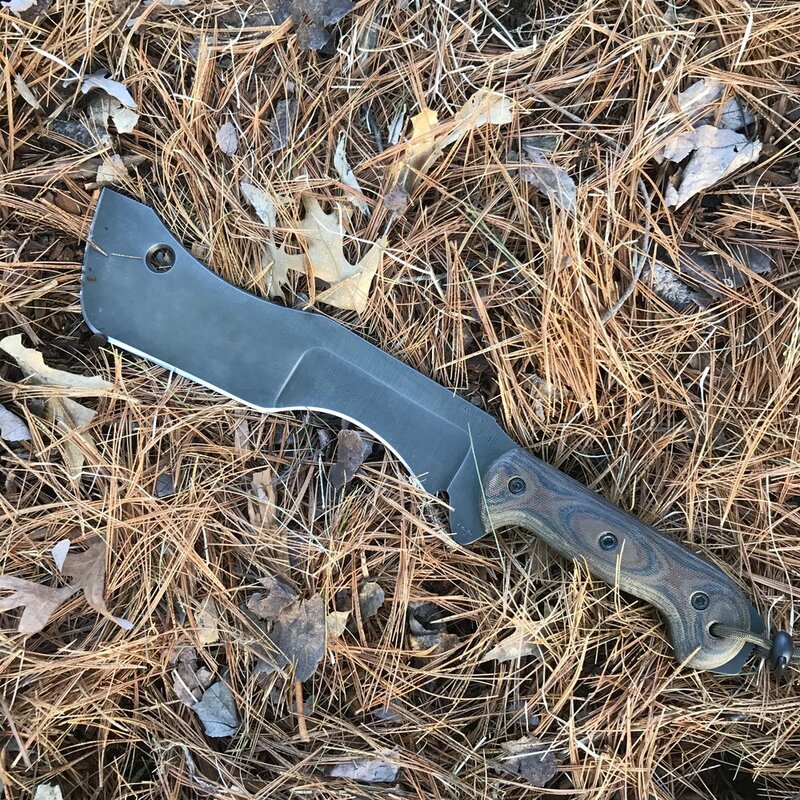 It seems that the “high speed, low drag” tactical trend in knives has run its course to some degree, though there are always tactical blades to be had. It also seems that the midtech trend is definitively dead. Why pay $600 for a bland version of a custom that is mass produced when you can pay $200 less for a true production knife that has all the bling of the original, with a few exceptions? Put another way, it is hard to justify paying $500 for a bare slab of titanium and a blade when the Steelcraft series has just as good fit and finish (and maybe better) with a ton more panache. If the market is moving away from tacticool and magical thinking prices on bland knives and towards more practical designs and better value, I am all for it. Its also nice to see a lot more small knives. Companies that NEVER produce small blades now have a ton of them. Cold Steel released a new bit of deployment tech, the HTR, and in their debut line up were a bunch of mid range knives and a 3 incher. This is not the old Cold Steel. Even Benchmade, maker of the boat anchor that cuts known as the Contego, grabbed a shrink ray and shot some of the best new knives from 2017 for their 2018 line up. Small knives, aka useful knives, it seems are in again. Even more interesting, there are new and very innovative players in the knife game. Specifically, Massdrop has done what they promised to do at their outset—revolutionize how enthusiasts purchase gear. And so we have arrived at a new point in the Golden Age of Gear, one where enthusiasts can drive the production of a knife designed by great custom makers, build by one of the best production companies on the planet, and brought to the masses by Massdrop. But that is only one of the cool narratives that happened in the last year. The other is the reemergence of Spyderco and Benchmade. In alternating years either stalwart did their best to put the “stall” in “stalwart.” Spyderco had quite a few snoozy years there for a while where the best new knife was an old knife with interesting steel. Benchmade’s doldrums were even worse. Year after year it seemed like they were more interested in designing things around the Axis lock than they were in making good knives. I was half expecting a fixed blade to include an Axis lock just for the hell of it. But in the past two years, both mainstays came storming back. Spyderco’s SHOT 2018 line up is easily the best I have ever seen in the 9 years I have been writing about knives. Doing some research back beyond that time, I still find nothing close. And Benchmade’s run of winners—the Proper, the Anthem, and the Bugout most notably—has been a true delight to interact with. The Big Boys are back. The there and back again of Spyderco and Benchmade were coupled with the emergence of a trio of really great Chinese brands—Kizer, Reate, and WE Knives. It seems like they spaced their debuts two years apart and with each new brand, the bar for performance, fit and finish, and design got raised. Kizer’s insane release schedule coupled with their cutting edge collabs have made them one of the best knife brands out there regardless of country of origin. Reate’s custom level finishing instantly put them in the conversation and their OEM work with designers like Todd Begg and Liong Mah have kept them there. And finally there is WE Knives—with the collab touch of Kizer, the finish of Reate, and flipping action that bests many customs, they have really stormed the market. But even that trend is not all that it is exciting in the knife world circa 2018. To quote the informerical, “but wait...there is more....”. We now have a steady flow from high end, small batch American companies. Some have been around awhile and are starting to push towards the mainstream and others are new. Think of these brands as the microbrews of the knife world, companies like James Brand (which carries the hipster swaggger) and stuff from Jeff Freeman. Its not onesies or twosies anymore. And if you throw GEC into the mix, well, you have a vibrant market outside the mainstays and the emergent Chinese brands. We now get a torrent of stuff from these microbrew American brands. If you are a knife enthusiast, it is a very, very good time to be alive. This is the state of the knife union and the union is strong. The time has come. The Dragonfly II in ZDP-189 is no longer my #1 recommended blade. The reality is that knife is perfect for me, but it is probably too small for some people. I recommend it all of the time, but I usually ask about the person’s size or preferences. The issue is simple—I am comfortable with the blade size, but some folks find it limiting. I think that if they used it they’d see there is no issue, but my preferences aren’t the same as everyone elses. That rethinking was prompted largely by the insane value of the Chaparral in FRN. Even as Spyderco bumped its prices across the board, this knife bucked the trend and is about $20 less than other Chaps. But it still has the Chap goodness—the perfect EDC sized blade at 2.75 inches, an amazing handle, and the sliceist blade this side of a graphene-producing laser. The clip is great, too. The Chap FRN is basically the DF II at a size more people think they need. It also happens to be insanely cheap for the steel. The CRKT Drifter is still an excellent value, but the crown has been passed. Ruike knives, which are made by the same comany that makes Fenix flashlights, are some of the best buys around. The p801 hits the market just right in terms of features and blade steel, all for a stunningly good price. And no, I am not forgetting about the excellent, but not quite as good LA Police Gear TBFK. It is so hard to find things to improve on this knife. It is perfect, absolutely-wouldn’t-change-a-thing perfect. I love the blade shape, I love the CF, I love the smooth piston feel of the pivot. This is an achievement in production scale knife making that makes it very hard for custom scale people to differentiate themselves. And when you see a person bust this out of their pocket be sure to tip your hat, Derek Jeter style, to them—you and they are both members of the Knife Intelligensia. With all this flippering and Moku Latte baloney floating around, what’s an old school knife guy to do? How about pick up the Benchmade Proper? Oh and so you don’t think I am trying to be trendy, skip that plastic “G10” (whatever that is!) material and go for the good ole fashioned micarta. Was good, is good, always will be good. Wait, what? The steel isn’t 1095. I am not doing this. Powder steel? No sir, that is not for me. I prefer steels that rust and need to be sharpen after every third use. Wait, actually, no I don’t. This S30V stuff is amazing. Yep, you keep your pivots loaded with balls and I will take this here nice, normal looking folder. Thanks. Grandpa out. Cheeseburgers are good. Bacon cheeseburgers are really good. Do you need one? No, probably not. But every once in a while, why not? Please exotic diet people with your kale shakes or bunless hamburgers wrapped in lettuce, don’t comment—this is an analogy not health food advice. In many ways all big bulky folders are like this, we really don’t ever need them. If you need the capacity to absorb hard use, get a fixed blade. Time and again I have skipped reviewing a folder because, well, it didn’t make sense to me. Given the price of many of the Becker Kabars and their size, why push a folder to or past its limits? So yeah, the Half Track is probably strictly unnecessary as are about 90% of modern folders, but that doesn’t mean they aren’t cool. I have a hard time passing over this knife when I am scouting my knife drawer in the morning trying to figure out what to carry. The size is just right, but surprisingly, I love the flipping action. Its not the smoothest in the world, but it is snappy in an addictive kind of way. The fact that it is a Hinderer shows you how much things have changed—a Hinderer with great action five years ago was like an honest politician, but now, apparently, it is par for the course. The looks are smoking, the in-hand feel is hard to beat, and the lock up is dead solid. If you want a funky folder with some heft, this is a very good choice. It also happens to be one hell of a piece of machining work and all USA Made. This is Mini Bodega complex at the same price and yet it still comes from my home state of Ohio. This is a hard combination of features to ignore. I love the thinner grind and I am a loyal member of Team Convex Grind. The sheath, of course, stinks, but bad sheathes are essentially the norm. After having a sheath made for the knife (by Bayou Custom Sheathes, he does a great job for a very good price with quick turnaround) I can’t think of anything I would complain about on the Bravo 1. The steel is amazing, the grind is, of course, great, and the handle just kills it. If you want all around goodness, this is the fixed blade to get. I can’t imagine ever maxing out its capabilities. Let me be the first to admit this seems to make no sense, on first blush, as both the SOG Pillar and the GSO 4.7 got 20/20 scores, higher than the Bravo 1's 16/20. But knife to knife, excluding the sheath I think the Bravo 1 is better than either of the other options, lacking the coating of the 4.7 and possessing a better handle than the Pillar. The sheath is horrendous, but for me, production sheathes are like the factory safety equipment on a table saw—even the maker knows their junk. A custom sheath makes the kit complete--its not just a knife now but a whole tool box that you carry on your hip. With that in mind, the Bravo 1 is the best of these three to build a kit around. It doesn't help the 4.7's cause that it is not readily available. Still, if you insist on not getting a sheath made, I think the SOG Pillar (review and purchase link) slots in well here. One day I will track down the special edition Fallkniven F1 with the non-kraton handles and we will see how it stacks up. If you’ve ever thought to yourself “How long would it take me to chop down a 300 foot sequoia with nothing but a knife?” then the M18 is for you (answer: you couldn’t, by the time you really started going a park ranger would rightfully arrest you). This knife is positively massive, easily weighing more than a pound. The heft and material-splitting capacities are off the charts. This is a big chopper that could chop other big choppers. But once you have the knife and use it you’ll find all kinds of little tricks you can do with it. The spokeshave debarked limbs like something from a saw mill. The front end was a great scrapper. Time and again I was surprised by just how capable this knife was at precision tasks. Hunters, of which I am not, tell me it is pretty good at popping joints. I have no idea, but I trust the folks that tell me these things. In all, this knife is crazy and awesome and crazy awesome. How good of a flipper is it? Better than any production knife I have ever handled. Add to the amazing action a veritable feast of design awesomeness and you have the Gent. Its not buy-it and ship-it available, but it seems like there will be a steady supply of them coming out of Massdrop and all for the bargain price of $80. I love this knife a lot. It is a thoughtlessly great carry. If you don’t have one, buy one. I got one of these for my son for his 7th birthday and he has been taken with it ever since. He loves having it on his hip as we stride through the woods. He really enjoys carving and slicing with it. He even enjoys sharpening it (because, well, I enjoy sharpening my knives too). But here is the thing, I have come to really like the knife as well. If you are on the fence about fixed blades or if you don’t think fixed blades can do well as EDCs, this is a sterling package. Also, it is a good knife for kids to start out with and learn the ins and outs of knife use. Oh, did I mention that it was under $40? Good stuff man, good stuff. My goodness is this a slicey knife. The elite tier of cutters used to have only a few entries—the Perceval stuff and the Chaparral, but folks are starting to move away from the tactical trend (thank friggin’ God) and knife companies are starting to notice. The Viator is in that upper tier of cutters, hanging quite nicely with the Chaparral. The stock is not quite as thin, but the blade is taller and so the end result is a knife that slices like something on top of a glass case full of processed meats. The fact that the knife has no lock and definitely 100% requires two hands to open means that there is another reason to track down the Viator. Its not just a wicked slica it is also a great knife for places with restrictions. What? You thought it would fall off the list entirely? If you are comfortable with all of yourself and don’t mind a small blade, this is still the best knife out there for the money. It has better steel than the Chaparral and it is even smaller and lighter (and just as slicey). You don’t need more. Honestly. Now hop in your 707 hp red Dodge Hellcat and drive around while hanging your arm out of the car wearing a massive Panerai Brooklyn Bridge. Oh and nothing pairs with a DFII quite like a Moku Ti light with a lion skull Steelflame pocket clip. Yeah, no compensating here. If you want to purchase any of these knives (except the Knife Art exclusive, which is, um, exclusive to Knife Art) take a look at the sponsor of the site Blade HQ.